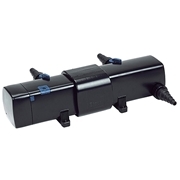 The OASE Biotec 32000 Pond Filter is a large mult-stage pond filter designed for large fish ponds and ponds with heavier fish load. The first stage of filtration directs the flow into the pond filter into a 300 micron mesh screen which removes course and fine debris from the water to increase biological activity in the next stages. This mesh screen automatically cleans itself every 15 minutes to drastically reduce maintenance and keep the filter operating at peak efficiency. 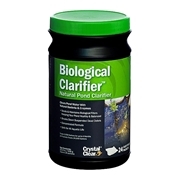 The Biotec 32000 pond filter's final stage uses Phosless cartridges to bind phosphorous that causes algae growth and remove it from circulation in the pond. These cartridges do need to be replaced from time to time. Dimensions: (L x W x H) 47" x 32" x 30"